Little Bit of Life, Love, and Fashion: Everyone Helps Out! It definitely feels like a Monday in our house today! After the weekend it is always hard to get things back on schedule. Since the birth of the twins I have found that I am a very schedule oriented Mommy! 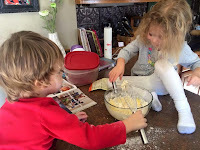 A one of the things that I think helps get the twins back into the groove of our schedule is making sure they are given the opportunity to help me get the house back in order after our weekend. I think every member of a household should be responsible for keeping the home in order, whether mom stays home or works outside the home. It not only makes them understand what it takes to run a house but also teaches them responsibility and gives them self-confidence. Plus, we have a lot of fun while working together. We talk and sings and sometimes just act silly together. It is finding the fun in the mundane that makes everyday good. I haven't always felt as strongly about children having chores. Several years ago I realized I was not doing my job as mom if I wasn't teaching them how to survive in the real world. Here's what that looks like in our home. The kids are all expected to clean and take care of their rooms. I don't touch them! They are expected to dust, change the sheets, and vacuum. We don't allow food or drinks in the bedrooms so it does make that job a little easier for them. They are given this responsibility when they enter jr high school. Upon entering high school, they are expected to do all of their own laundry, from sorting it, washing it, and putting it away. They are also given chores they are expected to complete daily & weekly. We don't pay them for these chores, it is part of living in this house. 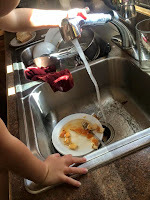 We do however, give them the opportunity to additional chores to earn money for things they want. A few challenges I faced in the past included making sure each person felt they were treated fairly and someone wasn't getting the most undesirable chore frequently. We have tested several systems of assigning chores in the past eleven years. Our blended family made assigning chores a little more complicated. I had to take into considerations the time they would be spending at the other parent's home. My step-daughters were not here on Monday and Thursday's and on those nights I would need to assign their chores to someone else. When the girls were younger we would wait to do the main chores on Saturday. 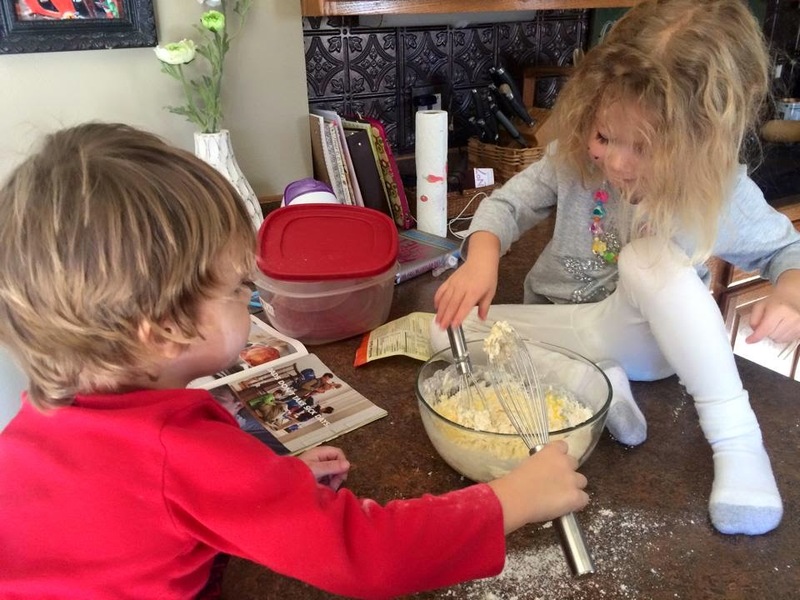 At first, I would assign each child three chores to be completed and would change that chore each Saturday. They were usually at our house every first and third weekend. Later, I would write the chores on strips of paper and each child would draw three slips and responsible for that chore for the entire week. Lately, the three girls still living in our home decided they would like to have certain chores they would be responsible for at all times. So far, that has been working well for us. It does cause a problem when there are numerous ball games but we make it work. Larry and I often pitch in and do their chore during that time just as we would want them to do for us if our schedules became extremely hectic. 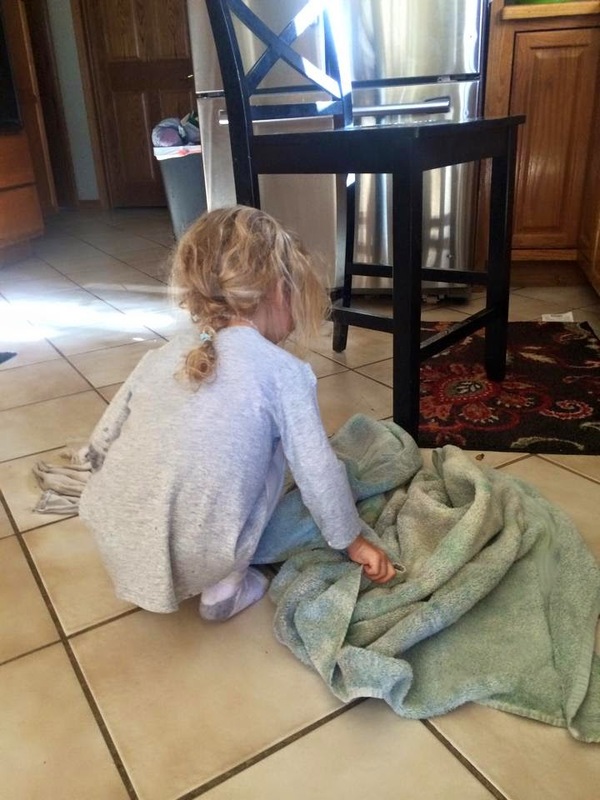 Age appropriate chores are also one of the biggest things to consider. 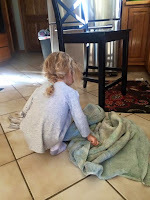 You can't expect a child to do a chore they cant physically accomplish. Also, keep in mind you will have to teach them how to do the chore as well as look over their work when they are done. I feel it is my job to make sure they do the job well and if that means we have to go back and do it over again, we will. It is equally important to let them know how proud you are of the work they have done. Praise is always a must! 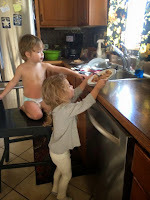 Below I am sharing a few pictures I took of the twins helping me out this morning! *Carry their plates from the table to the counter. *Wash off their dishes and put them in the dishwasher. *Wash off the kitchen table. *Put their clothes in the hamper. *I give them a dusting cloth and have them help me dust.